I had a kind of epiphany as I was looking over my students’ posts after our blues unit. I teach an online world music class and part of the students’ participation grade is to post weekly thoughts, questions, ideas, etc. on our discussion board. I couldn’t help but notice how many times they wrote: “the blacks’ music”; “their music”; and so on in reference to the blues. The blues is so essential to American popular music, but my students still see it as something separate, as something other. It’s been a while since I reviewed a textbook. But as I reached for the next one on my shelf this week, something gave me pause. It’s actually been quite a while since I used a textbook for the classes that I teach. The question of whether to use a textbook or not is one that has come up several times in talking with some of my colleagues who are in the same general situation as me (ABD, or very close, and teaching part-time at universities and colleges). Most of my colleagues choose the textbook route, but for several years (and particularly for my online classes) I have chosen not to textbook. So I thought I’d talk through some of my reasons and some of the challenges and freedoms of not using a textbook. 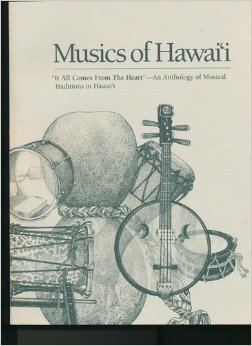 For this week’s review, I thought I’d change it up a bit by looking at Musics of Hawai`i: “It All Comes From the Heart”—An Anthology of Musical Traditions in Hawai`i, (published by the Hawaii State Foundation on Culture and the Arts, 1994/1997) a work that can’t decide if it’s a textbook or not. Dr. Ricardo Trimillos, in the Forward, calls this work a reference guide for the CDs, suggesting that one should listen to the CDs first and when something catches your ear, you can refer to the anthology for more information. 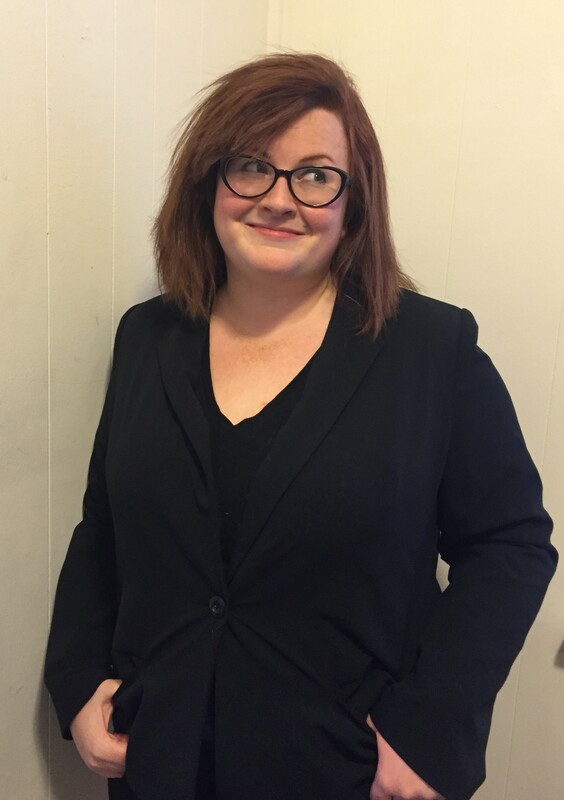 Bess Lomax Hawes’ “Speaking to Teachers” section, however, introduces ways this work can be used in classrooms and how teachers can (and why they should) engage students in music. On to the next textbook! 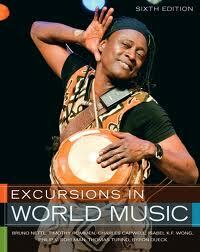 This week’s review is of Excursions in World Music, 6th edition, 2011, published by Pearson. Bruno Nettl is the general editor and, like Worlds of Music, each chapter in this textbook is written by a different author. Unlike WoM, however, some authors write more than one chapter in this text. 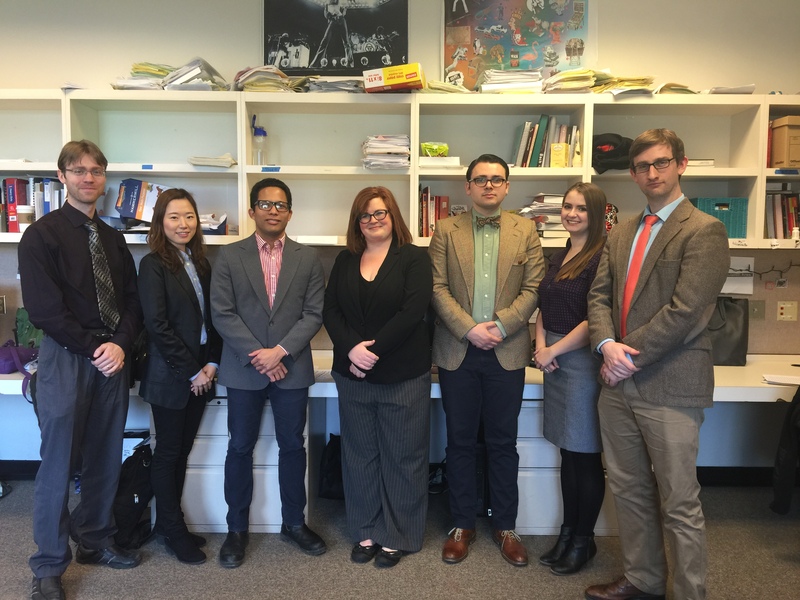 For example, Isabel Wong contributed the chapters on Japan and China, and Thomas Turino penned the chapters on Latin America and Sub-Saharan Africa. The first edition of Excursions in World Music was published by Prentice Hall in 1992 and featured most of the same authors and topics. Today we begin the great textbook review. 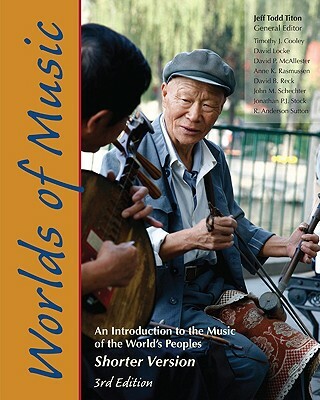 I decided to start with Worlds of Music: An Introduction to the Music of the World’s Peoples Shorter Version, 3rd edition (2009). Jeff Todd Titon is the general editor and each chapter is written by a different author. This “review” series will address the content of the textbooks, but I also wanted to include a bit of info regarding buying the book, different formats it’s available in, etc. This is more to cover practical information for (future) teachers. I am assuming (dangerous) that we’re all past the point where this would be a textbook in a class we’re taking. Of course the info will change over time, so this is just a (admittedly rather long) snapshot of what’s available now. The issue of textbooks is an interesting one. I know by just mentioning the term, I risk glazed eyes and a brief but effective mental shutdown before you click away, but bear with me. I’ve been preparing my online world music class for the fall and the question of textbooks always comes up. To use a textbook or not to use a textbook, that is the question…Well, actually that’s the first question. Many other questions follow: if I use a textbook, which one do I use? If I don’t use one, how do I find consistent readings? If I do use a textbook, do I use the full or shortened editions (if any are available)? Do I make supplemental CDs for the areas the textbook doesn’t cover? Do I make CDs for every student or do I put a few copies on reserve at the library? Is it ok for students to use an older edition? Are there any electronic copies available for students? I can’t fit the entire textbook into one semester, so which chapters do I pick? Do I go in order of the book or skip around? Why are questions about textbooks consuming my life? 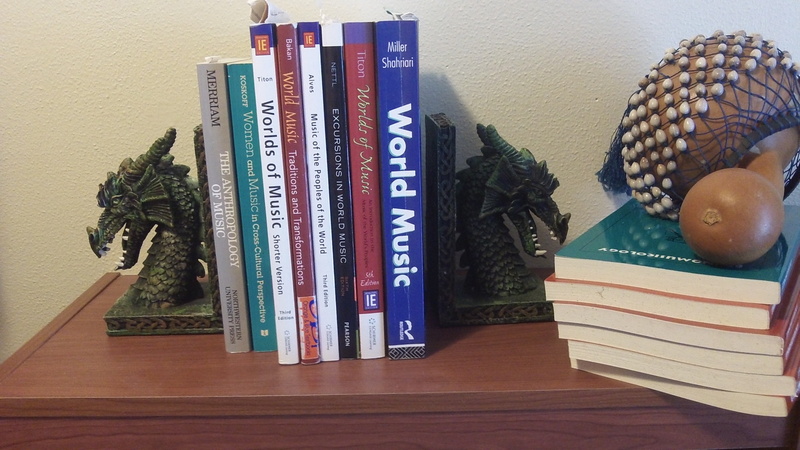 This all started as I was prepping for teaching an online world music class for this coming fall. I’ve taught online classes for several semesters and enjoy it very much. Every semester I try to change things up just a little, both to keep things interesting for my students but also to make sure that I don’t stagnate. I have, previously, always started the semester with a “what is music?” discussion. I’d have the students post their definitions of music and try to get them to engage with the definitions used in various textbooks. I couldn’t help but notice that this question is one of the first issues tackled by most world music textbooks.